This post has been sponsored by Udi's®. All thoughts and opinions are my own. Over the last year and a half, we’ve made some pretty major changes in our household—including lowering our carb intake and drastically reducing the gluten in products that we consume. I’ll be honest and say that at first, I thought these changes were going to mean that life was going to get a whole lot less delicious. 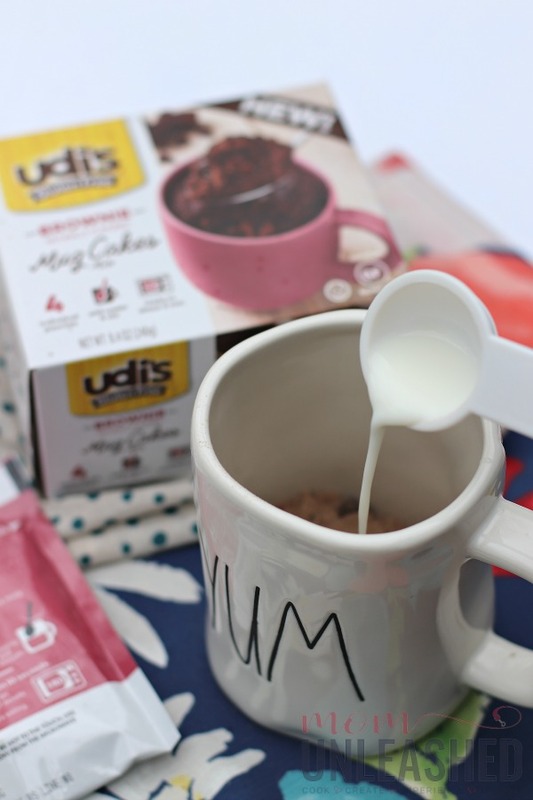 But after discovering sweet snack options for gluten-free living, like Udi’s® Gluten Free Mug Cakes, I’m learning that living my best life doesn’t have to mean making either/or decisions when it comes to food. I can make smart choices for myself and my family. 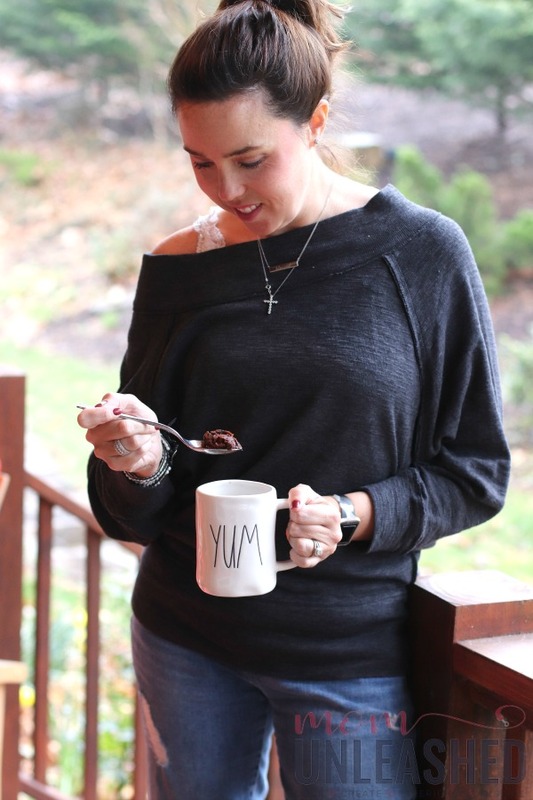 And when I need a little sweet pick-me-up or a way to connect with my teen over something warm and gooey, I can do it the easy (and gluten-free) way with one of my new favorite products from Walmart. 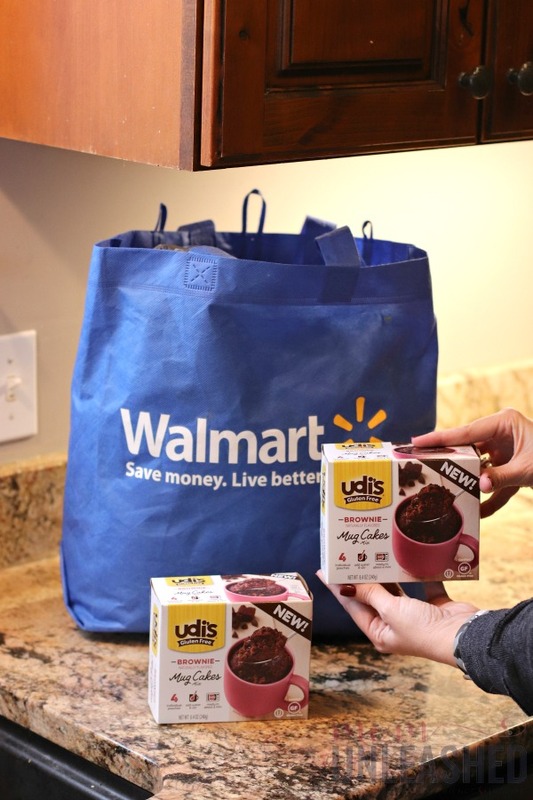 So, pull up a chair, get ready to drool, and don’t forget to save now at Walmart on Udi’s Gluten Free Mug Cakes while supplies last! Then, let’s talk about some sweet snack options for gluten-free living. 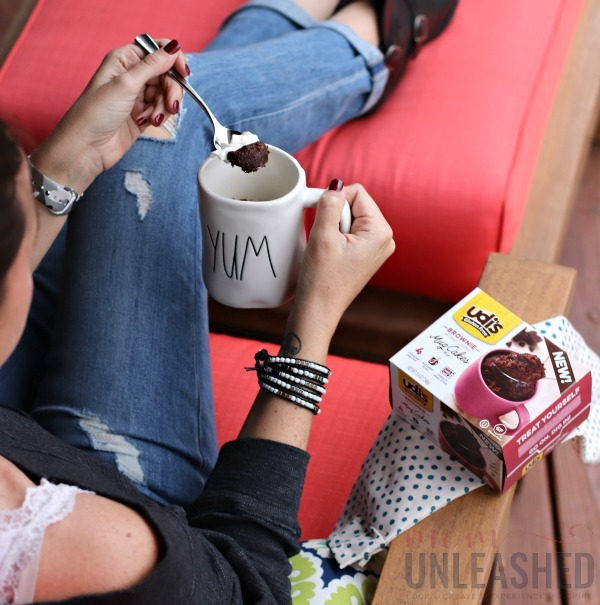 Now, before I get to showing you how I relax, unwind, and celebrate with Udi’s® Gluten Free Brownie Mug Cakes from Walmart, let me share a little more of our journey to living a reduced gluten lifestyle (notice that I do stay reduced gluten because we are not a totally gluten-free household). Most of you already know that about a year and a half ago, my teenage son was diagnosed with a few autoimmune conditions. Around the same time, I noticed that I wasn’t feeling great. I swept things under the rug (as all moms tend to do) and continued on with life without thinking much more about it. However, as we continued with my son’s medical journey, his doctor mentioned that many of his autoimmune conditions could be genetic and began to ask about how I had been feeling. I explained my symptoms of just feeling “ick” after meals and she suggested that I try reducing my gluten since gluten sensitivity and celiacs are in the same wheelhouse as the conditions that my teen had been diagnosed with. At first, this perplexed me. I had already made the change to whole wheat based grains and thought that would be enough. However, after doing my own research, I learned a whole lot more about gluten and the products that contain gluten. Then, I made some major changes. Since my son was already eating a reduced-gluten diet, I decided to join him and limit the gluten in my own life. Let me tell you, I’ve felt fabulous ever since making this change and while, yes, we occasionally have gluten in our household, for the most part, I live a gluten-free lifestyle. However, as anyone who has gone to a low-to-no gluten lifestyle knows, when you eliminate gluten from your meals, you have to change the way you eat. For the most part, it wasn’t a huge struggle for me since I’m more of a protein and veggies eater. But desserts…that was the area where I struggled oh so hard. We don’t have dessert every day in my home but truthfully, mama has a sweet tooth and I was missing my brownies. I was being strong though ya’ll cause, truthfully, I was feeling so much better. Then, on a trip to Walmart, the heavens opened and the angels sang as I perused the gluten-free section near the snack aisle. Right in front of me was a brand that I was already using in my reduced-gluten eating, Udi’s, in a form that said brownie right there on the label. At first, I thought it was too good to be true. After all, I couldn’t live a low gluten lifestyle and have sweet snack options for gluten-free living, too, could I? Well, come to find out (hallaluah! ), that answer is yes. 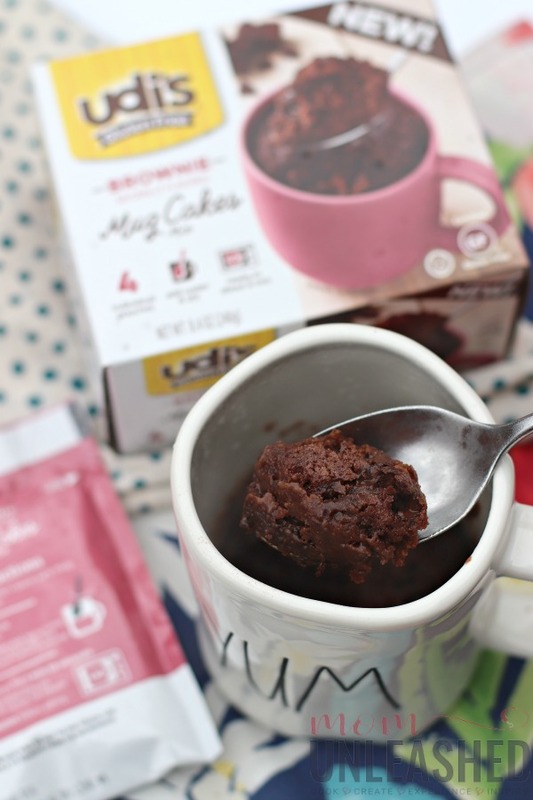 Let me tell you, I stocked my little buggy up with Udi’s Gluten Free Mug Cakes and I might have gone a little heavy on the brownie option. Then, I headed home to see if Udi’s Gluten Free Mug Cakes were the answer to desire for sweet snack options for gluten-free living. 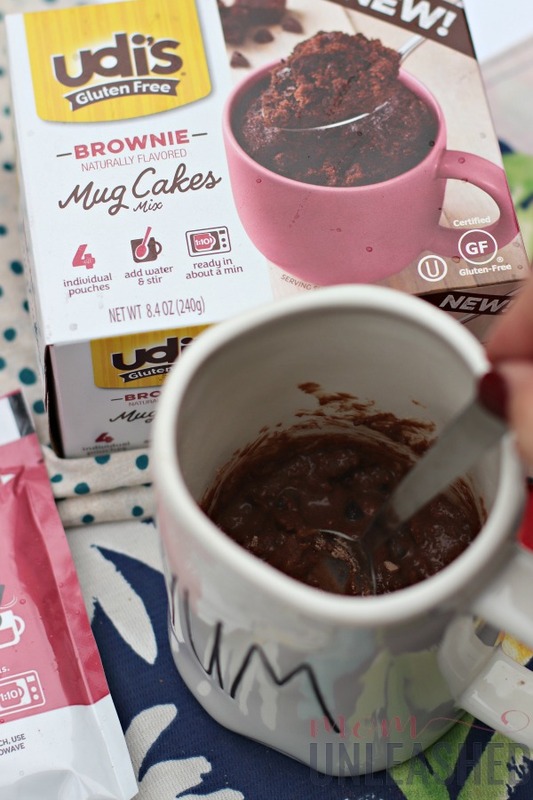 Contrary to what you might think, I didn’t immediately whip up an Udi’s Gluten Free Brownie Mug Cake. I knew that, for me, there are certain times of the day when I just really want to treat myself. So, I placed my gluten-free options on the shelf in my pantry and then carried on about my day. I washed clothes. I cleaned the kitchen. I finished several projects that had been pending on my to-do list. Then, when everything was done and I was feeling that sweet-in-itself feeling of accomplishment, I reached for my newly found gluten-free way to treat myself and one of my favorite mugs. Knowing that I had a little bit of time before the kids got home and the craziness of the afternoon rush kicked in, I pulled out one package of my perfectly portioned, single serve treat that only takes one minute to prepare. 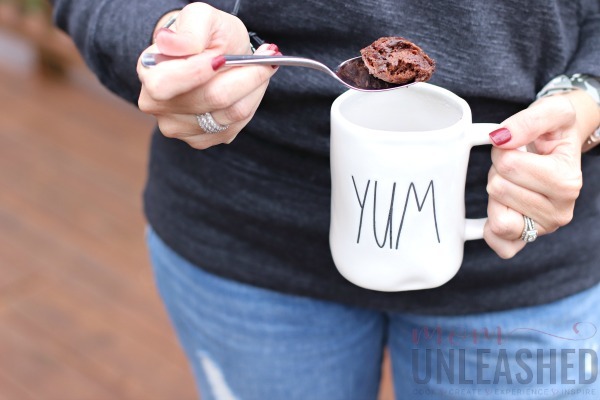 While these Udi’s Gluten Free Brownie Mug Cakes can be made with water, I adore substituting milk to give my brownie mug cake that extra creamy flavor. In fact, it’s easy to substitute liquids like milk, coffee (hello morning time treat!) and more to make these perfectly sized mug cakes. After adding my milk, stirring my mixture in my mug, and popping it into the microwave for one short minute, I had a decadent, warm, gooey snack in hand that’s gluten free, soy and wheat free, naturally flavored, and has no preservatives. As I took my first bite, this whole reduced gluten journey came together for me. While I’ve been doing well on it but really missing my sweets, I no longer have to. Instead, I can treat myself to a warm snack or dessert that satisfies my sweet tooth even when I don’t have time to spend in the kitchen. 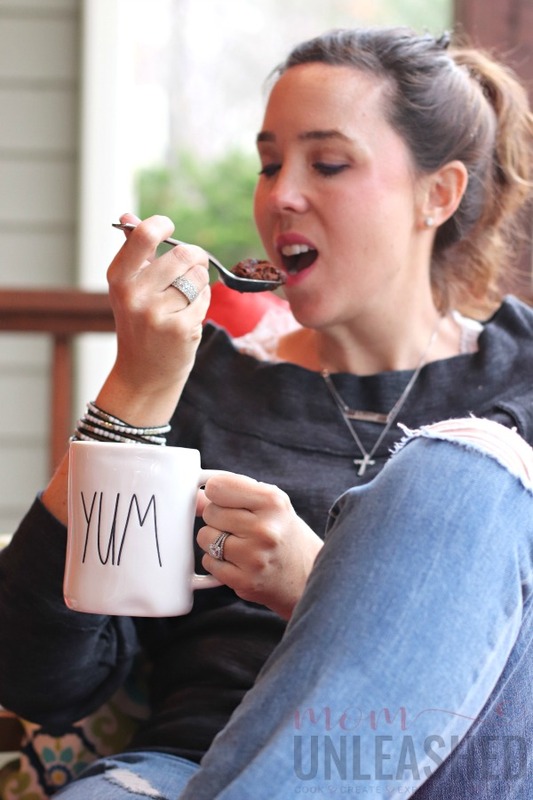 Even better, I can pair my totally delicious mug cake with toppings like ice cream, whipped cream, nuts, chocolate chips and more to take an already perfect sweet snack or dessert that tastes like a total indulgence to new levels of deliciousness while still keeping it blissfully gluten free. Now, I already told you that my I used my sweet treat as a way to relax and unwind after all my daily activities were done and before the kids got home. 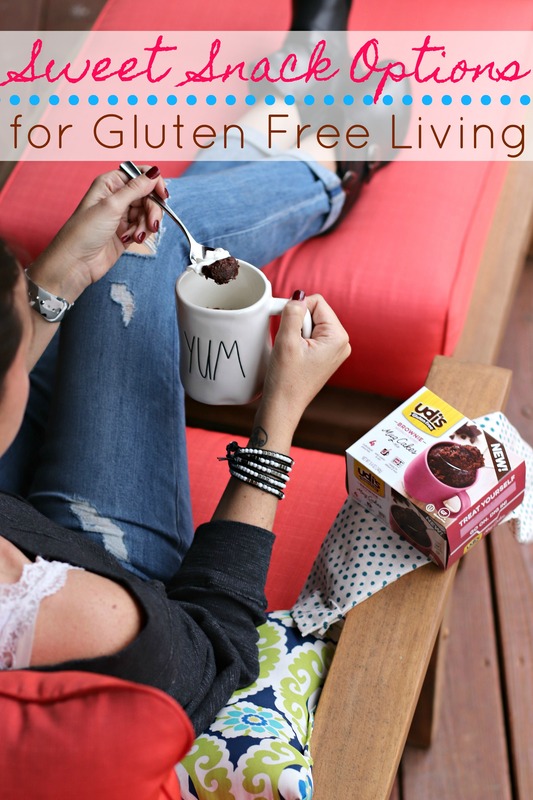 As I savored the sweet chocolate flavor of my Udi’s Gluten Free Brownie Mug Cake, it suddenly hit me that, just as my teen’s journey had helped me get on track with a reduced gluten lifestyle, I should repay the favor and let my newly discovered sweet snack options for gluten-free living show him that he can have a tasty snack or dessert even when eating gluten free. So, once he got home and finished working through his homework, I asked him to sit down with me. 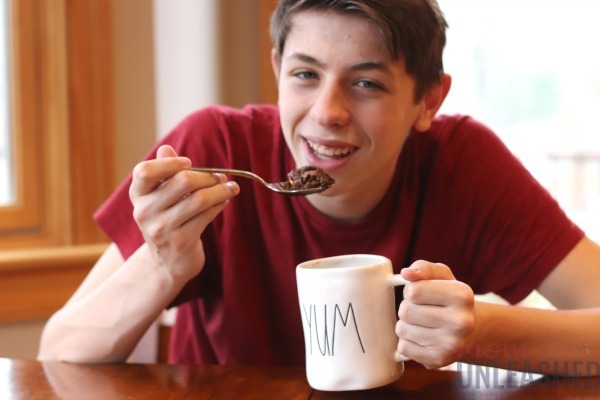 As I served him up his very own Udi’s Gluten Free Brownie Mug Cake, we talked about his day, discussed his plans for the coming week, and reconnected in a way that was as sweet as the delicious treat I shared with him. 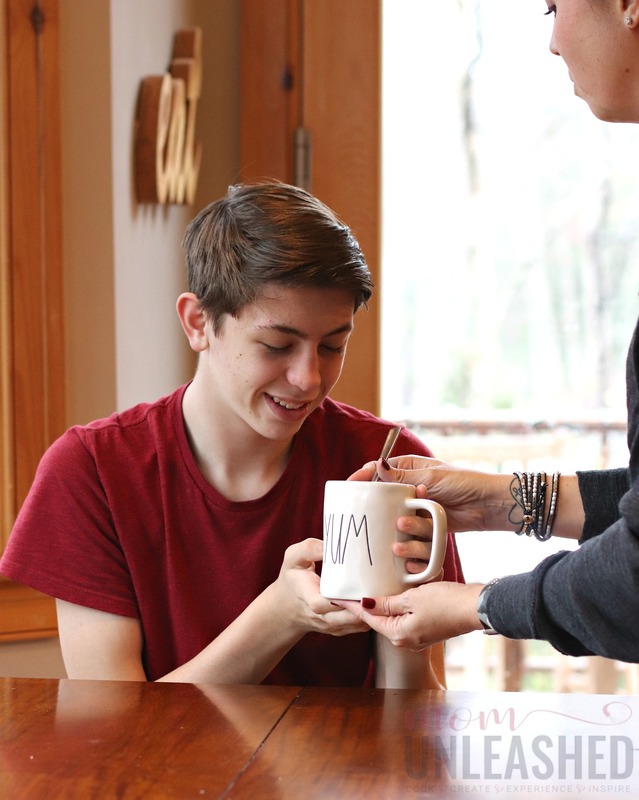 Whether I’m looking for the perfect gluten-free way to relax and unwind, celebrate special moments, or connect with my teenage son who also lives a reduced gluten lifestyle, I’ve now got the perfect sweet snack options for gluten-free living to make everyday moments amazing in the most delicious, gluten-free way. Now it’s your turn. 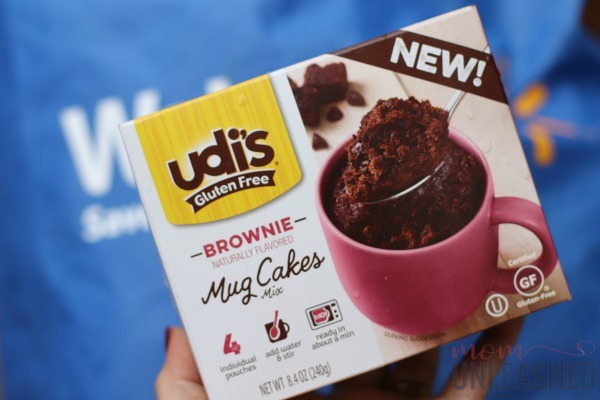 Whether you’re already gluten free, have been considering going gluten free, are curious about living a gluten-free lifestyle, or are simple looking for sweet snack options for gluten-free living, head to Walmart today and pick up Udi’s Gluten Free Mug Cakes in a variety of flavors. 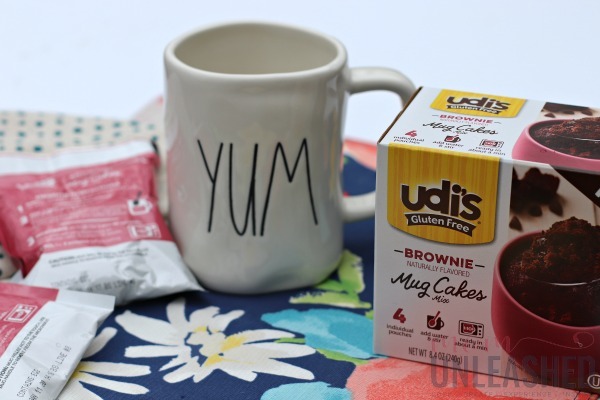 As the first dedicated brand of gluten-free mug cakes available, Udi’s has proven once again that eating gluten free doesn’t have to be boring and can instead be delicious, decadent, and above all easy! Ready to stock your pantry with this gluten-free treat that is sure to satisfy? 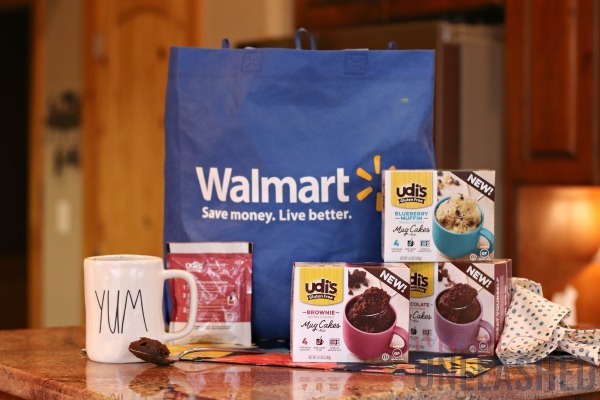 Save now at Walmart on Udi’s Gluten Free Mug Cakes while supplies last. Then tell me, do you live a gluten-free lifestyle and which of the Udi’s Gluten Free Mug Cake varieties will you be treating yourself with? Oo I love these mug cakes! They are so quick and delicious. It’s cool that they made some gluten-free. I’ll tell my MIL who is gluten-free. Sometimes we just need a sweet pick me up all to our own before the kids and hubby get home. This wold be a quick way to achieve something yummy. We love mug cakes! We have a few different kinds in our cabinet. Udi’s is probably the biggest gluten free brand around where I live. Not a lot of options around here haha! But it’s a brand that I recognize! Ha! We are both talking snacks today and I have a whole bunch of gluten-free options too! Not this tasty looking mug cake though, YUM! We are lucky we do not need a gluten free diet but it might be better for us. I made a mug cake and this one seems so good I will look for it. Now these sound like some absolutely great snacks! It is wonderful that it is becoming easier to get gluten free things these days to allow people to have treats from time to time. I like that a lot more things are becoming gluten free. People who have an intolerance to it, or just simply want to cut it out of their diet now have another sweet snack they can enjoy. Oh, I have never heard of these! I do really enjoy trying out new gluten-free options. I’ve found some great gems throughout the years. I had no idea these existed! I’m going to pick some up next time I go to the store. I love mug cakes and this one looks delicious. I don’t have to be gluten free, but I know some people who do, and I’ll be passing this brand on to them. Quick, easy and perfect for satisfying a sweet craving. This is a great gluten free option! Thanks for sharing this with us. I didn’t know Udis was making brownies now. I’ll have to try them, they look tasty. Ahh, so easy to prepare whenever I crave for something! I can’t wait to taste this! I like this gluten free brownies, I need to try it for my self. Looks delicious also. Best part it is easy to get from Walmart. I had no idea that UDI’s had a mug cake. Now I want to try it for myself. 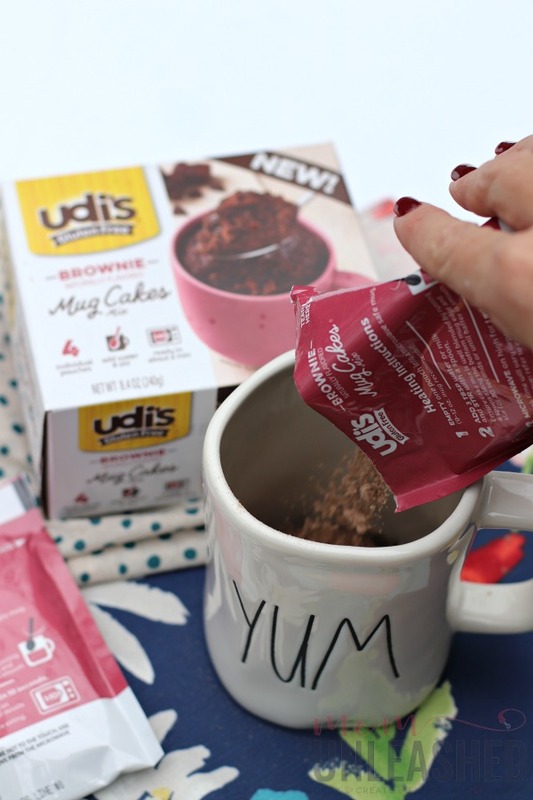 I love Udi’s products This product would be perfect for my busy life.